The graph largely speaks for itself, but there's a bit more to be said in terms of specific numbers. First, according to their numbers, the Market has been adding more apps per month since October of 2010. Second, it's since continued to pick up the pace (notice that you can see it ramp up quite dramatically beginning in August of 2010). 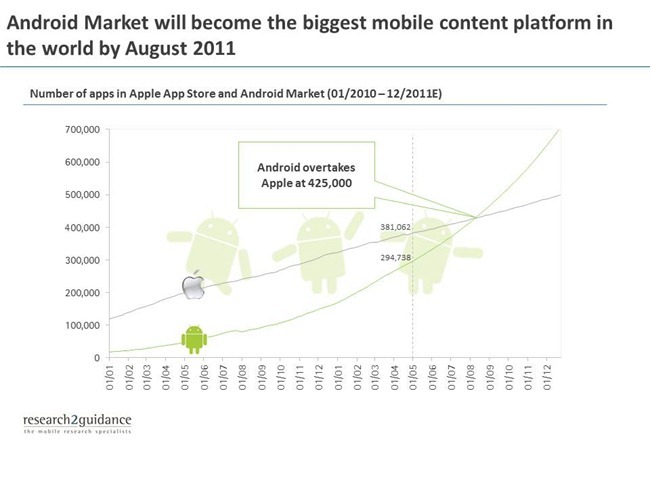 Specifically, the market added 28,000 new apps last month, while the App Store added just 11,000. The short-term nature of the prediction limits the likelihood of interference (such as Google tightening its grip and dramatically slowing down adds), and is a major reason why I'm inclined to accept the prediction. That said, it's not clear where they got their numbers, which the prediction is (obviously) completely reliant on. Still, the only real reservation I have - and it's a minor one, all things told - is that they assume the store will continue to grow at an exponential pace. That can't go on forever, and when the growth will start to slow is anyone's guess... but it probably won't be in the next 3 months.